Now look at step 2 … you might think that it is EULA (End User License Agreement) for my application … but if you read details you will see that it is actually some kind of utility for “Coupon Companion” !!! WTF … And look at so called “Terms of Service” … I guess it’s just polite way to write off unlimited access to your personal information for sole purpose of data mining !! 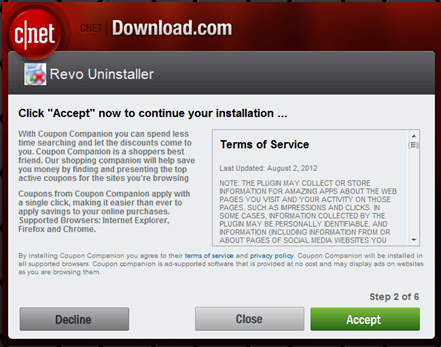 … still page title is misleading … it reads … “Click Accept now to continue your installation” …. but it actually has nothing to do with your actual installation, you can just click on decline and installation will still go through. Now see step 3 … again same story as step 2 .. another junkware … “Amazing Emoticons and Animations” … now why would in my right mind I want this Amazing Emoticons for my facebook or gmail or whatever I am using ?? Again you can decline this installation and still can continue with installation, but it is not mentioned anywhere ! 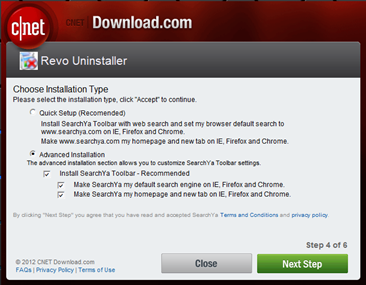 Now look at steps 4 screenshots above, if you simply click on more “recommended” quick setup method then it will install some “SearchYa toolbar” plus it up as your homepage .. plus default search engine …. basically it will just hijack your internet settings. 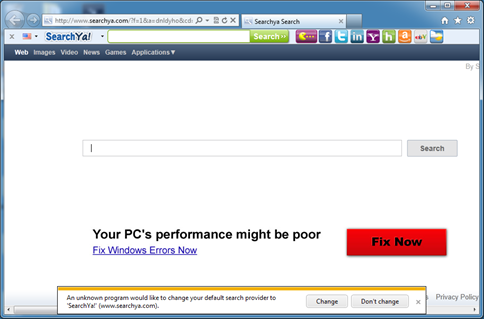 Now please tell me why I would like to use “SearchYa” then Google, Bing or Yahoo ? 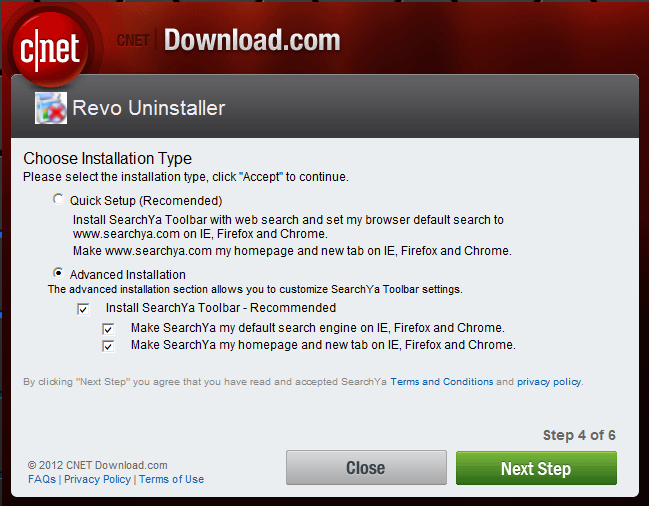 Now let’s look at step 5 … where you actually being downloading your software that you requested … First screenshot is where you DECLINE all places and also don’t install “SearchYa”. Size of download is about 2.5MB. And second shot is when I clicked on ACCEPT on all places plus chose to do “recommended” quick setup, in this case download size is about 9 MB !! See that advertisement in big red …. all it is missing is red flashing lights with big siren sound that if you click on that link you are screwed . However interesting thing is I don’t see that “Amazing Emoticons” or “Coupon Companion” addons anywhere except add/remove programs list. 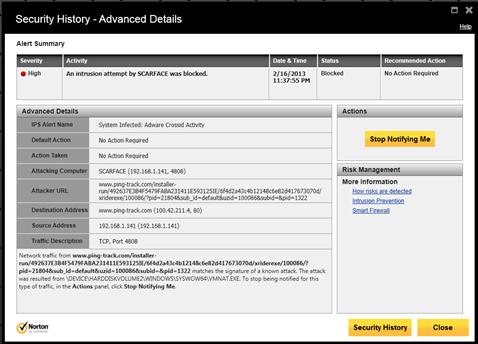 May be it’s because my NAV’s intrusion prevention system blocked it ? And the software for which I wrote this whole saga, “Revo Uninstaller”, I actually ended up downloading directly from their site (and I felt it’s safer that way ). 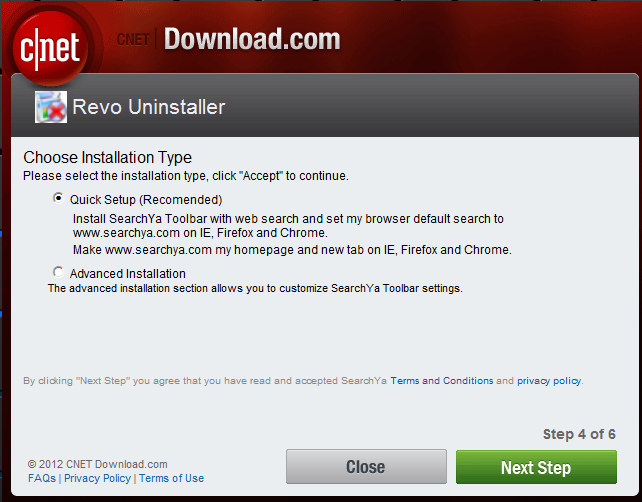 For sake of this whole demo I installed this application from CBS, in my VM so it don’t do anything to my main machine. I have never cared reviewed about software that I don’t use for my work but with my recent experience with this installation process made me write this whole frekin thing to get this thing out of my chest . CBS being an advertising company, I can understand they try to do data mining of internet users but I think in this case it is simply wrong. But in short, I will try to avoid this site from now on. 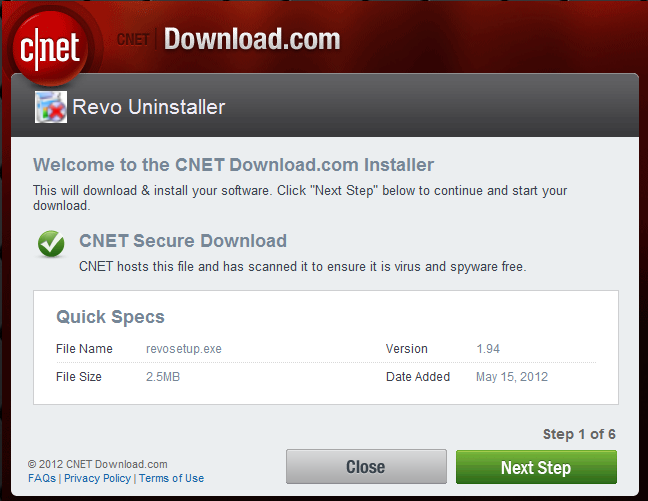 May be I will use it just for reviews but not for downloads. This entry was posted by Gaurang on February 19, 2013 at 11:57 am, and is filed under Babbling, Tips. Follow any responses to this post through RSS 2.0. You can leave a response or trackback from your own site.